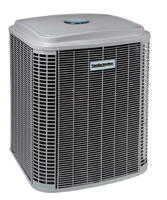 Comfortmaker heat pumps provide both cooling and heating to your home. Comfortmaker® SoftSound® SXT+ Two-Stage Heat Pumps featuring the Observer™ communicating system are designed to take your home to a new level of comfort and efficiency. Teamed with our Observer communicating wall control and a Comfortmaker communicating fan coil or gas furnace, the SoftSound SXT+ functions as part of a complete communicating home comfort system. Various components of the system “talk” to each other electronically, fine-tuning comfort levels while maximizing energy savings.